In my previous post, I mentioned there was a leak in the roof of our hen house. It was not apparent until I cleaned in there and found a wet spot on the floor under the leaves we had used for bedding. Tom is really busy now that the summer market season has begun. So, I took it upon myself to fix this leak. I mean how hard could it be! First, I had to find the leak. That turned out to be easy since I could see daylight shining through a small hole where the metal roofing was nailed to a board supporting the roof. Then, I had to find the caulking gun and a tube of caulk that was appropriate for outdoor use and could be used on metal. We must have a dozen half-used tubes of various kinds of caulk. This one looked like it would work. Next step was to drag a ladder into the coop so I could get up there to fix the leak. Trying to get the tip of the caulk tube into the space between the board and the metal was more difficult than it looked. I ended up squeezing a WHOLE BUNCH of caulk into the space hoping that it was enough to seal the hole and stop the leak. Here's what it looked like after I was finished. The caulk was a brown color. So, all that brown smeared stuff is the caulk. It's not pretty, but at least you can't see daylight now. I guess time will tell if I stopped the leak. At any rate, our chickens must have appreciated my efforts the keep their home in good repair because they rewarded me with 2 fresh beautiful eggs! We love our chickens. They give us eggs, not to mention the enjoyment we get out of watching their antics. However, there are some drawbacks, not many, but some. One of those is having to clean their living quarters. This should be done every week or so, but with gardening season in full swing, we've kind of let it slip this time. The last time it was cleaned, I suggested we use some of the leaves that Tom collected last fall and winter for mulch to put under the roost bar. This is where most of the chicken "poop" accumulates. We had been using wood shavings under the roost. These come in large bags you can buy at any farm store and are used for animal bedding. But, the leaves were free and seemed like a good idea. They worked okay, but the wind and chickens scattered them all over the coop and they were a nightmare to clean up. Feeling somewhat energetic, I decided to tackle the job. First, I assembled my tools. The snow shovel worked well initially to scoop up large bunches of leaves. These were deposited into a wheel barrow. Once the worst of the leaves were removed, I used the broom and dust pan to sweep up the rest. There were a lot of leaves in there! This is what the inside looked like after I had finished. I wish I had remembered to take a picture of it before I started cleaning. There were leaves all over the floor and piled up in the corners. Notice the wet spots on the floor. The one in front happened when I moved the chickens' water shown in the lower left corner. However, the one in back was caused by a leak in the roof. The leak was not apparent until I removed the leaves over in that corner. The leaves were hiding the wet spot. So, the next chore will be to fix the leak. There was one casualty from the chicken house cleaning. My broom broke. Bummer. Back in February, I wrote an entry on how we transplanted some asparagus that had grown up in weeds out in the field. We moved it into one of our raised beds where it will be much easier to take care of and keep the weeds out. It is beginning to come up. When I first noticed it, there were just one or two spears in the bed and they looked like this. Today, I went out to check on it and this is what the bed looks like. I transplanted some lettuce plants into the same bed since there was plenty of room and we will be cutting them to take to market in a couple of weeks. So, they won't interfere with the asparagus's growth. I will not cut these asparagus spears this year. They need to grow tall and feed the roots to help them get well established. Maybe next year, I'll be able to start harvesting some of the spears. There is some asparagus left out in the field that we missed when we transplanted these plants in to this bed. It is beginning to come up as well. Tom is putting pink flag markers beside these. That will help us find them next winter if we want to transplant some more or them. This is just one bunch that he found. There are several others. I'm quite amazed they have survived the hot dry summer. They got no water last summer when we were in the depth of the drought. Yet, here they are like a phoenix rising from the ashes! One sure sign of spring is the birth of baby lambs. Our neighbor has a couple of sheep and each spring we look forward to watching the lambs that are born. The sheep are Suffolk sheep. These sheep have black legs and a black face, but their wool is white. Here is a picture of one of the sheep and her lamb. Notice that the lamb is black. As it gets older, it will gradually grow wool that is white, like its mother. Last year each of his sheep had twin lambs and it was so much fun to watch these little lambs run and play, just like children. Also, notice that the lamb has a long tail. Yes, that's right, sheep are born with long tails, like other livestock. However, early in their lives the tail is removed in a process called "docking". This sounds cruel, but it is better for the animal because it helps to reduce the build up of feces which can encourage fly larvae. The ewes are very watchful of their lambs. Notice the ewe in the above picture is taking a stern look at me while I was taking this picture. I have seen them charge toward an errant dog that happens by the fence. We have a small patch of wild blackberries on the farm. The last two summers have been very hard on them because we have not been able to water them, nor have we had the time to take care of them properly. Blackberries are propagated by underground runners. New canes grow from these runners every year. These canes do not produce fruit the first year. So, you can always expect the fruit to grow on last year's canes. As a patch of blackberries matures, they tend to develop into a mess of live and dead canes that are full of thorns so that you almost need to wear a suit of armor to pick them. However, if you clean out the old canes after they fruit each year, it makes the patch much more manageable and allows for easier picking of the fruit. During the winter months, blackberries are dormant and you'd swear they are dead. Here is what our blackberries look like today. However, I noticed that they are showing signs of life as evidenced by the new leaves on some of the canes. They have lots of thorns! I hope to have time in the next few weeks to go in and clean out the old dead canes. Guess, I'll have to go dig out that old suit of armor. Tom built a new hoophouse earlier this year. It is a lot smaller than the original one as you can see in the following picture. The new one is built of stock panels that can easily be obtained from your local farm store. These were bent over to form the structure. It was fairly simple to build. The trick to holding the plastic on is something called "wiggle wire". Wiggle wire is hard to explain. So, here is an illustration of how it works. The wire comes in a long strip that has been bent back and forth. It fits into a metal channel that is screwed to the hoophouse structure. It is amazing how well this works. We have a lot of wind here in our part of Oklahoma and have had no trouble with the plastic blowing loose. As you can see from the above picture, Tom has already putting it to good use. Below is a better picture of what he has planted. On the left, he has a loose-leaf lettuce mixture composed of several kinds of lettuce. Down the middle, there are some bok choi plants interspersed with spinach. On the right side, he has 2 different kinds of kale He has a soaker hose strung along the rows for watering. He tells me that he is pleased with how this hoophouse turned out and is already thinking about building another one. We are almost finished transplanting the peppers and tomatoes from the seed starting trays and into the pots where they will grow until being set out in the garden. I shared the new method I was using to start the seeds this year in the following post. So, now I want to share how I go about transplanting the seedlings into the pots. This post shows the last set of peppers to be transplanted. First, fill a flat of pots with potting soil. The potting soil is usually pretty dry. So, I like to water it some before I start. Then, I use a marker to make a hole in the middle of each pot. Next, I gently pry a "fork full" of seedlings out of the seedling tray, like this. And, gently separate the little plants. Then, using the marker, I gently push the roots of the seedling into the hole in one of the pots. 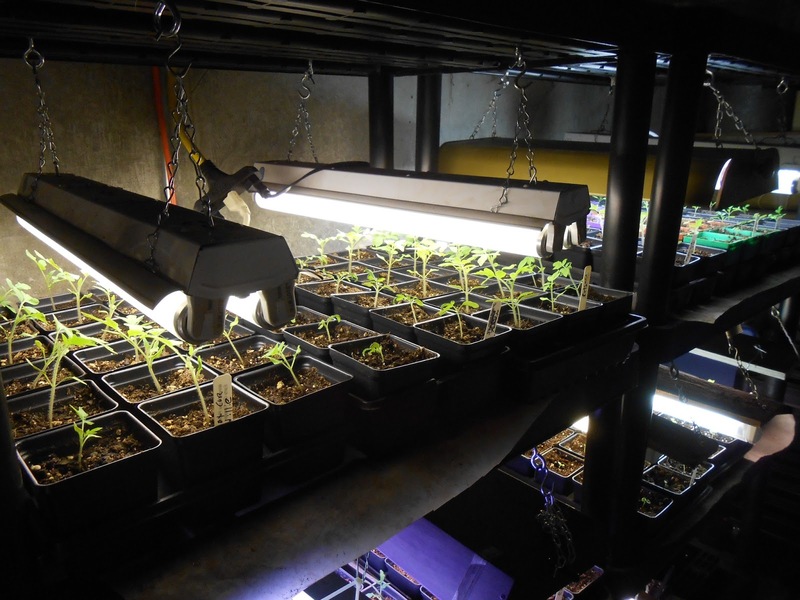 Finally, I water the plants to help settle their roots into the soil and set them under lights in our basement. A friend of mine at work told me about an idea she ran across on how to use empty toilet paper roll tubes in the place of peat pots. It sounded like such a good idea, I had to try it. So, this is what I did. First, I saved empty toilet paper roles, like this one, until I had enough for the project. Next, I cut them in half. I retrieved a plastic pan I had saved from a pound of hamburger (making sure to wash it good first) and placed as many of the halved toilet paper rolls in it as I could squeeze in. Then I filled the tubes with planting soil and watered them well. Finally, I transplanted some tomato seedlings into each one and put them on a shelf under the grow lights. You could just as well plant seeds in each one. I just had a bunch of tomato seedlings that needed transplanting, so I used those.